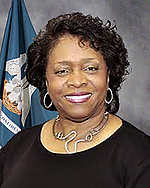 Barbara West Carpenter (born December 1943) is the dean of international relations at historically black Southern University in Baton Rouge, Louisiana, who is a Democrat member of the Louisiana House of Representatives for District 63 in East Baton Rouge Parish. In the primary held on October 24, 2015, Carpenter, the second-placed contender, was placed into a runoff contest with fellow Democrat Ulysses Zembles "Bones" Addison (born August 1961), a former member of the Baton Rouge Metro Council who runs a market research firm. The incumbent Dalton W. Honoré, another African-American Democrat, did not seek reelection. She subsequently defeated Addison, 58 to 42 percent. District 63 represents areas of Baker, Scotlandville, and Zachary. She resides in Baker. Carpenter is a former board member of the East Baton Rouge Parish Housing Authority. As representative, she vowed to tackle budgetary issues related to higher education. In March 2016, Carpenter joined a House bipartisan majority to enact a one-cent increase in the state sales tax. State representatives voted 76 to 28 for the tax hike, a part of the revenue-raising measures pushed by Democrat Governor John Bel Edwards. A House and Senate conference committee subsequently trimmed the duration of the tax from five years to twenty-seven months, effective from April 1, 2016 to June 30, 2018. Even the sale of Bibles and religious publications and Girl Scout cookies are now subject to the tax. Carpenter graduated from Southern University and Kansas State University in Manhattan, Kansas. ↑ Barbara Carpenter, December 1943. Louisiana Secretary of State. Retrieved on April 6, 2015. ↑ Results for Election Date: 10/24/2015. Louisiana Secretary of State. Retrieved on October 27, 2015. ↑ 3.0 3.1 3.2 Andrea Gallo (November 21, 2015). Barbara West Carpenter defeats Ulysses “Bones” Addison in race for House District 63 seat. The Baton Rouge Advocate. Retrieved on April 6, 2016. ↑ 4.0 4.1 Barbara W. Carpenter. intelius.com. Retrieved on April 6, 2016. ↑ State House of Representatives Vote to Increase Sales Tax. KEEL Radio (February 25, 2016). Retrieved on March 28, 2016. This page was last modified on 17 November 2017, at 17:45.